[147 Pages Report] The thrust vector control market is projected to grow from USD 8.39 Billion in 2017 to USD 13.77 Billion by 2022, at a CAGR of 10.41% during the forecast period. The base year considered for the study is 2016, and the forecast period is from 2017 to 2022. The report analyzes the thrust vector control market based on technology (gimbal nozzle, flex nozzle, thrusters, rotating nozzles, others), application (launch vehicles, missiles, satellites, fighter aircraft), system (actuation, injection, thruster), end user (space agencies, defense). These segments and subsegments were mapped across major regions, namely, North America, Europe, Asia-Pacific, and Rest of the World (RoW). The report provides an in-depth market intelligence regarding market dynamics and major factors, such as drivers, restraints, opportunities, and industry-specific challenges influencing the growth of the thrust vector control market, along with an analysis of micromarkets with respect to individual growth trends, growth prospects, and their contribution to the overall market. 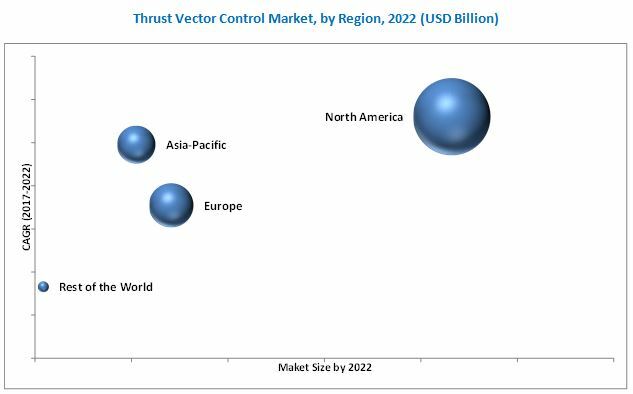 The report also covers competitive developments, such as contracts, new product launches, agreements, and research & development activities in the thrust vector control market. The market size estimation for various segments and subsegments of the thrust vector control market was arrived at by referring to varied secondary sources, such as OMICS International, Bloomberg Businessweek, European Defence Agency, through corroboration with primaries, and further market triangulation with the help of statistical techniques using econometric tools. All percentage shares, splits, and breakdowns were determined using secondary sources and verified through primary sources. All possible parameters that affect the market were accounted for, viewed in extensive detail, verified through primary research, and analyzed to acquire the final quantitative and qualitative data. This data is consolidated with detailed inputs and analysis from MarketsandMarkets, and presented in this report. The ecosystem of the thrust vector control market comprises raw material suppliers, manufacturers, distributors, and end users. Key players operating in the market include Honeywell International, Inc. (U.S.), Moog, Inc. (U.S.), Woodward, Inc. (U.S.), Jansen Aircraft Systems Control, Inc. (U.S.), BAE Systems (U.K.), Wickman Spacecraft & Propulsion Company (U.S.), Parker Hannifin, Inc. (U.S.), Sierra Nevada Corporation (U.S.), Dynetics, Inc. (U.S.), and SABCA (Belgium). 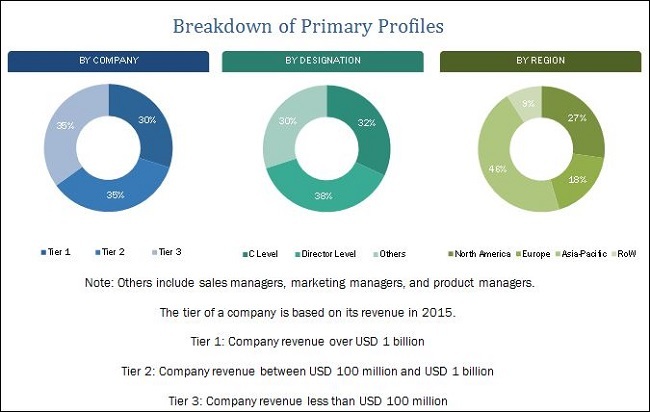 These players have adopted strategies, such as contracts, new product developments, and agreements to strengthen their position in the market. The thrust vector control market is projected to grow from USD 8.39 Billion in 2017 to USD 13.77 Billion by 2022, at a CAGR of 10.41% during the forecast period. Rise in the implementation of thrust vector control in fighter aircraft to gain superiority over enemy aircraft during aerial combats, increased investment in space exploration programs, and increased adoption of thrust vector control in next-generation guided missile systems are the primary drivers for the growth of the market. The market has been segmented based on technology, application, system, end user, and region. Based on technology, the thrust vector control market has been segmented into gimbal nozzle, flex nozzle, thrusters, rotating nozzle, and others (injection, jet vanes, tabs). The flex nozzle segment is estimated to lead the market during the forecast period. The growth of this segment is due to the increased implementation of flex nozzles in satellite launchers and missiles because of movable seals and high actuation power. Based on application, the thrust vector control market has been segmented into launch vehicles, missiles, satellites, and fighter aircraft. The fighter aircraft segment is projected to witness the highest growth during the forecast period. The rise in acquisition of fight aircraft with super maneuverability features by countries such as China and India is expected to drive the market during the forecast period. Based on end user, the thrust vector market has been segmented into defense and space agencies. The defense segment is projected to lead the market during the forecast period. This is due to increased need for highly maneuverable fighter aircraft to gain an advantage over aerial opponents. The geographical analysis of the thrust vector control market covers regions, such as North America, Europe, Asia-Pacific, and Rest of the World. North America is estimated to lead the global thrust vector control market in 2017, owing to increasing spending on space exploration programs in the region, as well as heavy investments done by the U.S. in missile research and highly maneuverable aircraft in defense. Advancements in thrust vector control technology require high R&D and are complex in nature. This, coupled with the increasing use of reusable launch vehicles and boosters, is expected to restrain the growth of the market. Products offered by various companies operating in the thrust vector control market have been listed in this report. Major players in the market include Honeywell International, Inc. (U.S.), Moog, Inc. (U.S.), Woodward, Inc. (U.S.), Jansen Aircraft Systems Control, Inc. (U.S.), BAE Systems (U.K.), Wickman Spacecraft & Propulsion Company (U.S.), Parker Hannifin, Inc. (U.S.), Sierra Nevada Corporation (U.S.), Dynetics, Inc. (U.S.), and SABCA (Belgium). 13.13 Jansen’s Aircraft Systems Controls Inc.